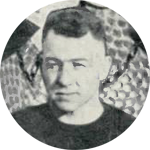 Ross Petty played on the University of Illinois freshman football team in 1913, the year that Robert Zuppke started his 28-year tenure as head coach. The designation “Fighting Illini” had yet to be adopted as the sports teams were referred to then as “Indians”. Playing tackle, Petty received his varsity letter the following year as the U of I won its first national title. He anchored the line again in 1915 and was named to the All Western 2nd team for his play in 1916. He graduated in the spring of 1917 with a B.S. in Agriculture. One of six children, Petty grew up on a farm in “Petty Township” in southeastern Illinois’ Lawrence County surrounded by loads of aunts, uncles and cousins. By the time he was 17, two of his older siblings were already teachers. Soon after graduating from college he went into the U.S. Marine Corps as a Sgt. in the “Naval Aviation Service.” At the end of W.W. I he returned to his father’s Lawrenceville farm and appears to have enrolled as a graduate student in agriculture. However, by September 1920 he joined four other U of I varsity letterman working in the Staley factory and preparing for the promised football season. On October 3, 1920 he started at left guard in the first professional football game played in Decatur. He started 10 of the 13 games that season, received his $1300 end-of-the-year bonus, returned to Lawrenceville and never played pro ball again. In the summer of 1922 he attended “coaching school” at the University of Illinois, married Lela Winkles and began work as the football coach at Watseka High School. In the 1930s and 1940s he and his wife moved between Chicago and Westmont, IL with their son and daughter and ran grocery stores and delicatessens. He later returned to education and taught at Crete Monee High School, retiring in 1959. He moved to Waukesha, Wisconsin and passed away at the age of 73 in 1966. He is buried at the Sumner Cemetery in Lawrence County, Illinois.